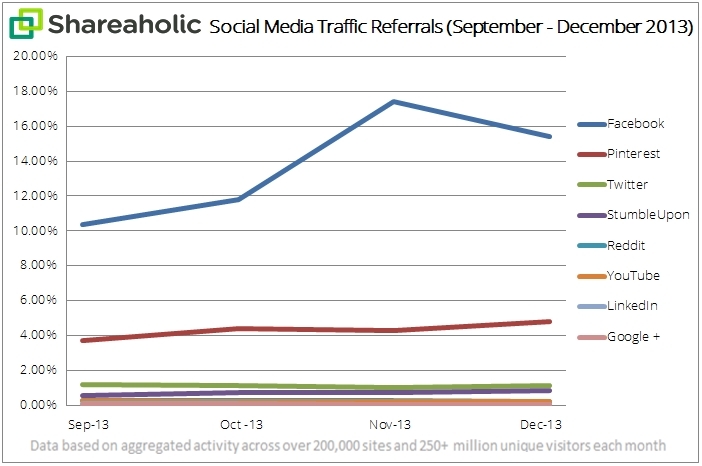 Facebook saw its referral traffic to a group of more than 200,000 websites with over 250 million monthly unique visitors rise 48.85 during the fourth quarter of 2013 when compared with the third quarter, for an increase of 5.07 percentage reports, according to the latest figures from Shareaholic. Shareaholic said Facebook drove more than twice the traffic of the other seven social networks in its report combined — Pinterest, Twitter, StumbleUpon, Reddit, YouTube, LinkedIn, and Google Plus — adding that its upward trajectory peaked in November, at 17.41 percent, before slipping to 15.44 percent in December. Readers: Did any of the findings by Shareaholic surprise you?